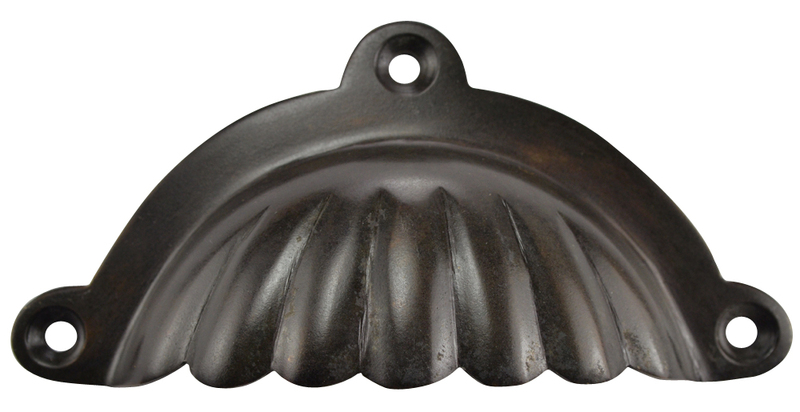 Solid Brass Scalloped Style Cup Pull (Oil Rubbed Bronze). Measures 4 inch in length and 2 inch tall. Center to center distance is 3 1/2 inch (3.50 c-c). Has a projection of 2/3 inch. Comes complete with mounting hardware. Available in Polished Brass, Antique Brass, Oil Rubbed Bronze (shown), Polished Chrome, Brushed Nickel, and Flat Black finishes.